Also called Tee Ball Baseball is for boys and girls 5-6 years old who want to learn the fundamentals of hitting and fielding. It is recommended that all players play 1 year of A-Level baseball. In A-Level, players hit ball off a batting tee. The primary goals of A-Level are to instruct children in the fundamentals of baseball and to allow them to experience the value of teamwork. Rosters may be composed of between 10 and 15 players. Coach pitching is permitted in this division once boys and girls are ready. The diamond used is a 60-foot diamond. All players bat in every inning and all play the field. No score is kept in A-Level ball. This is an instructional division for boys and girls that have completed 1 season of A-Level baseball. A 6 or 7 year old player who has already played A-Level baseball may opt to repeat this division depending on desire and skill level. This division is unique in that it is a combination of player and coach pitch. The players pitch the first 2 innings. There are no walks allowed, but a hit batter does take their base except if hit accidentally by coaches pitch. Furthermore, after 4 balls have been pitched the at-bat teams coach will come in to continue pitching until the batter either hits or strikes out. This keeps the game moving and increases the amount of fielded plays. This pitching philosophy is beneficial in 2 ways: It gives the batters a chance to hit pitches from a child their own size, and it is beneficial to the pitchers who get some experience pitching. No child is allowed to pitch more than 1 inning per week in this division. Score is kept in this division but this still considered instructional ball. This is also an instructional division. A 7 year old may play up to this division, assuming they have played at least 1 year in A and 1 year in AA divisions. In AAA Division, kids pitch the entire game. There are no walks allowed, but a hit batter does take their base if hit, except if hit accidentally by coaches pitch. After 4 balls have been pitched, the at-bat teams coach will come in to continue pitching until the batter either hits or strikes out. Base stealing is not permitted in any instructional division. Minor League Baseball division is for players ages 9-10. This division is exclusively player-pitch. The diamond used is a 60-foot diamond and the pitching distance is 46 feet. In the minors division, base stealing is permitted once the ball passes the batter. The 9-10 year old baseball division includes a tournament program which gives children of this age the opportunity to experience tournament competition, up to state level. Players on these teams can be chosen from among the division teams. This division is for boys and girls ages 9-12. The majors will play a 20 game season. The first 12 games will played using traditional Little League rules. The diamond used is a 60-foot diamond and the pitching distance is 46 feet. The last 8 games and playoffs will be played using Little Leagues's Intermediate 50/70 rules. The diamond used is a 70-foot diamond and the pitching distance is 50 feet. There is a Tournament Team (or "All Stars") of 11-12-year-olds from within this division, and the team may enter the International Tournament. The culmination of the International Tournament is the Little League Baseball World Series, featuring teams from around the globe. All expenses for the teams advancing to the World Series (travel, meals and housing) are paid by Little League Baseball. 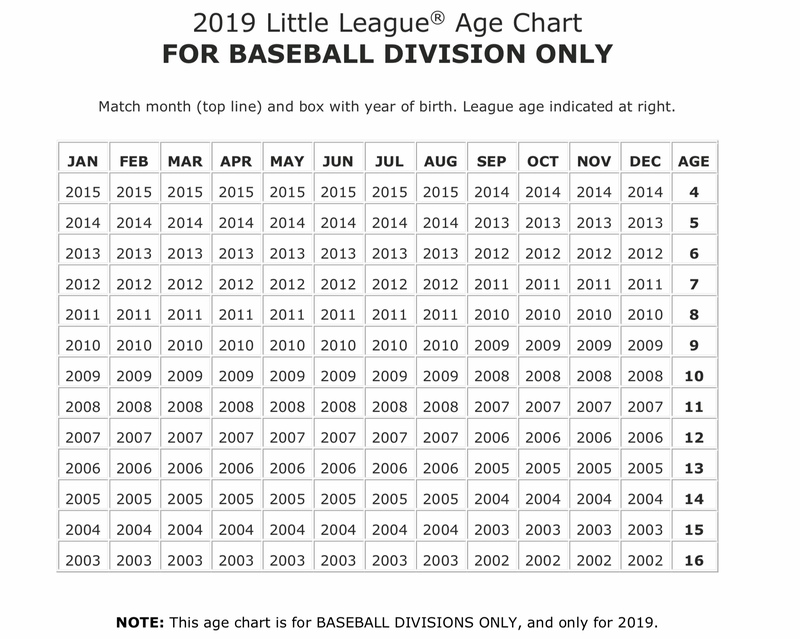 Please reference the chart below to determine your childs "playing age"...Alternatively, you may use the Age Determination Calculator by clicking here .